If you live in Central Oregon you’re probably familiar with the McKenzie River and you’ve likely heard about the McKenzie River Trails. 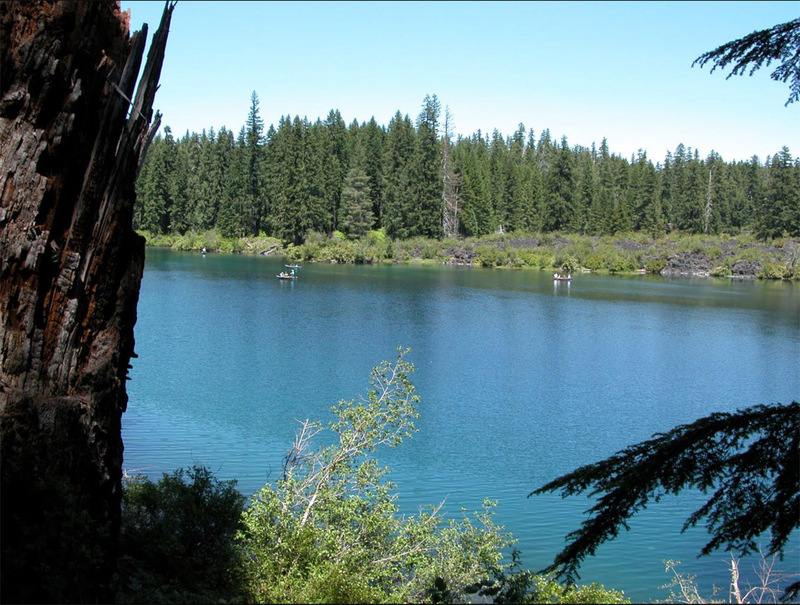 You may know that the head of the McKenzie River flows out of nearby Clear Lake, but you may not realize that there is also a beautiful loop trail that provides a good workout at Clear Lake. This system of trails is managed by the Willamette National Forest and the loop trail is about a 5 mile trek. To access both the loop trail and the McKenzie River trails I like to park at the privately owned Clear Lake Resort (see map), although parking spaces can be hard to get at peak season, so arriving early in the day is always optimal. Clear Lake is a popular resort offering non-motorized boating, fishing, camping and hiking. The really cool thing about this loop trail is that you get to meander all along the parameter of the crystal clear lake while passing through deep and mysterious old growth forests, through an extensive lava field, over several bridges and flowing streams, as well as through a campground and the resort. There’s something very ancient-feeling about the forests along this trail, as they frequently remind me of hiking in the redwood forests of California. Although there may not be any redwoods, there certainly are some huge old growth pines along the trail. This is a ‘true nature’ hike in that there is a lot of wildlife and birds along the way. In fact, the first time I saw a Water Ouzel was along this trail near the main bridge where the little swimmer was fishing and diving for bugs in the water. Once I figured out what to look for, I was able to spot several groups of these unique little birds on later hikes taken lower down on the McKenzie River trails. 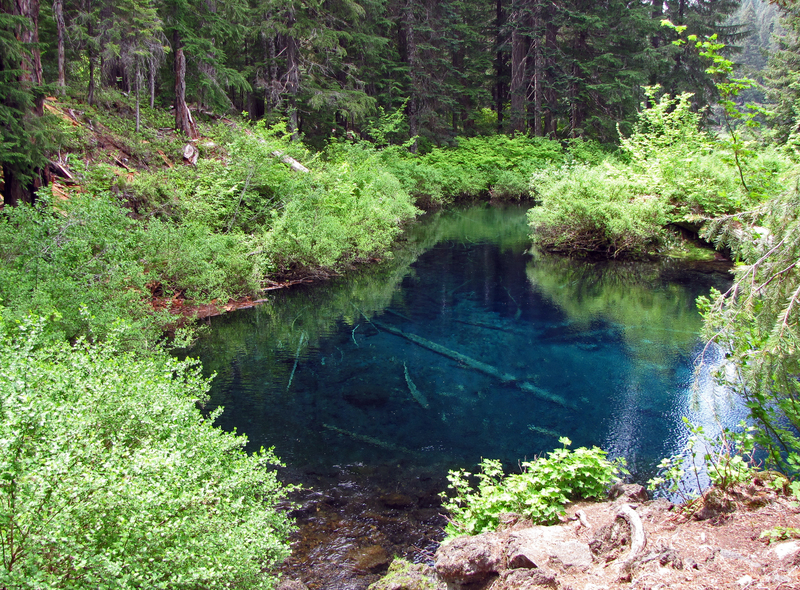 In addition to exploring the crags of a lava field you’ll get to see where the McKenzie River is born out from underground, right into Clear Lake. It’s pretty amazing when you consider how much water is flowing down the McKenzie and how this water seems to just spring up from nowhere to form Clear Lake. It’s all very deep, and very blue – and very cold. If you’re into flora as wall as fauna you will no doubt appreciate the wide variety of shrubs and plants, and depending on the season there can be an endless assortment of blooming flowers all along the way. Blooming flowers attract butterflies and other nectar enthusiasts, so there is no shortage of species of these little critters if you hit the season just right. The Clear Lake Loop Trail never fails to wear us out, but it’s a very pleasant hike and one deserving of annual repetition. It’s a great hike to take a backpack lunch on, and you’ll need to keep some water handy for people, if not the pooch. 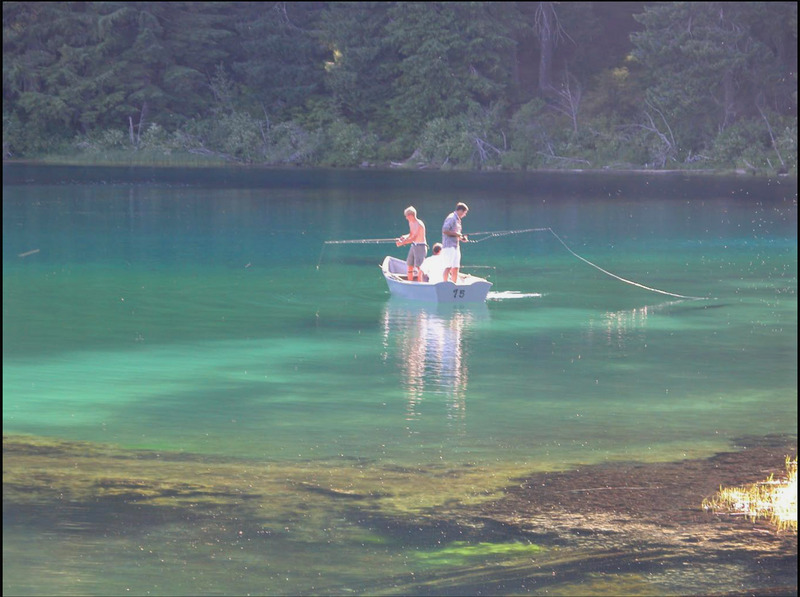 Clear Lake is a popular place for fishing and all boats are non-motorized. What you’ll see: deep clear watery views, birds of prey (Osprey usually) and smaller birds, interesting insects and some people. You’ll see quite a few people at and along the resort and camping area, some hikers and a few hiker-dogs.